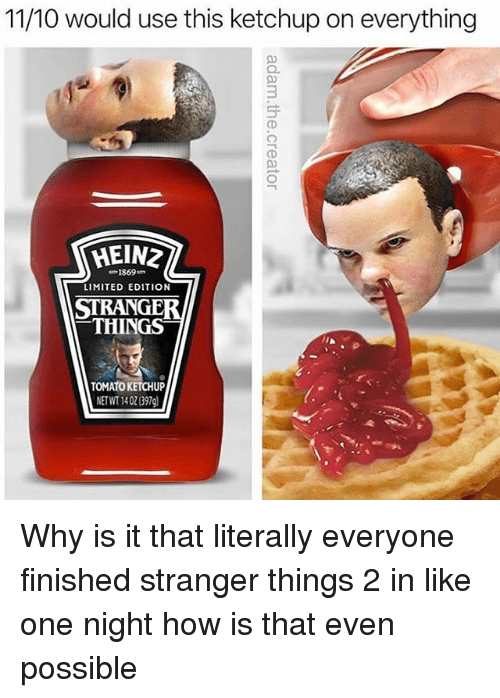 Since Season 2 of Stranger Things has aired I thought some people would like to discuss the show to this point. After binge watching season 2 the day after it released I can honestly say it didn't disappoint. The pacing of the show was a little different, but I feel like that was necessary since we went into the second season knowing the enemy. I'm also glad they confirmed the Season 1 theory that the slugs become demogorgons? I guess in many ways it was even better than the first season. Is it true that the show will have the third season? It's been pretty well confirmed that season 3 is a definite, with season 4 VERY likely. I read in an interview somewhere that the Duffer brothers don't want it to drag out too much. They'd rather have 4-5 great seasons and end it. Not sure if that will remain true if the show continues being wildly successful. The vibe created is perfect. The 80's. The HP Lovecraft monster is perfect. The characters grew up a bit. That was done well. I especially like to see 11 evolve. The gate is closed but that doesn't mean it can't get reopened. After all the bad bad government is still there. This leaves further seasons a possibility. Here are my favorite series: Stranger Things (ALL), Fringe (all seasons), Some seasons of American Horror Story, Ash Vs. Evil Dead, The Walking Dead, Lost (ALL), Jessica Jones, The Defenders, The Man in the High Castle, Daredevil, Luke Cage and Black Mirror. Of course you can't forget the classics such as Twilight Zone, The Outer Limits, Tales from the Crypt, Amazing Stories and Alfred Hitchcock Presents. The part where they morse code to find out Will is still in there felt totally repetitive of season 1 with the alphabet on the wall. You can call it a callback, I call it unoriginal. Eleven and a dude with a shotgun takes out the big bad in five minutes. Kind of ruined the ending. Also big scary CGI tentacle thing reaching out through the portal didn't look great, especially when we got fairly decent CGI monsters throughout the season (for a tv show). I didn't like that the story with Eight didn't go anywhere except teaching Eleven to hate and love. It was a nice departure from trope that the evil looming corporate business conglomerate D.O.E extension was actually trying to do right, and wasn't running around offing people. Even with that taken into account, it was a 9/10 season for sure. For next season, we got a demadog in a freezer, Eight running around causing mayhem, a loose spirit that came out of Will, Max's brother still getting beat up at home (I mean, you got to have some sympathy there), and the US invading the upsidedown looking for oil probably. It's going to be a long wait! and the US invading the upsidedown looking for oil probably. It's going to be a long wait! I felt the Morse code was an okay means to get around Will being controlled by the monster. Hard to believe the smoke monster wouldn't know about it though? Will can see his thoughts so why couldn't the monster see his? over analyzing for the win I guess. I get why they brought Eight into the season, but I feel like it was done too quickly. I don't feel like there was enough character development there. The scenes did serve as an explanation on why Eleven's powers increased enough for her to close the gate though. My head scratching moment was Elevens mom. Is she stuck between worlds, psychic to a degree, or what? Her mom led her by the lights which we've seen from people in the upsidedown and it appears she is only capable of speaking coherently when Eleven uses her powers.